More than 23 billion profit-seeking dollars flowed into ecosystem-friendly investments over the past five years, but less than $2 billion of that came from the private sector. Most of that $2 billion, however, went into sustainable food and fiber a sector that’s been growing at 26% a year and looks set to surge by at least $5.5 billion through 2018. In fact, $1.5 billion has already been raised, a new survey finds. 6 November 2014 | They call it “conservation impact investing,” and the authors of a new report entitled Investing in Conservation: A landscape assessment of an emerging marketc define it as c“investments intended to return principal or generate profit while also driving a positive impact on natural resources and ecosystems.c Co-authored by EKO Asset Management Partners and The Nature Conservancy’s NatureVest division, the report says that $23 billion flowed into conservation impact investing over the past five years. The public sector, in the form of development finance institutions (DFIs) like the International Finance Corporation, accounted for $21.5 billion of that, with private investments accounting for just $1.9 billion. Those numbers include investments in everything from watershed protection to habitat conservation, but they don’t include renewable energy, green buildings or anything that conserves nature as a byproduct instead of a primary objective. While the private sector component is small, it’s also incredibly dynamic, growing at an average annual rate of 26% from 2009 through 2013. Two-thirds of that growth came in sustainable food and fiber production, including forestry, and the survey finds $1.5 billion or about 79% of the total invested over the past five years now on the books and ready to be deployed. The survey also says there are concrete plans to raise and invest another $4.1 billion through 2018. “What the report tells us is that this is not a money problem, says report co-author Ricardo Bayon, a partner with EKO Asset Management. “It is about coming up with appropriate financeable deals. If we’re successful, it will mean that billions of new dollars will flow into efforts to improve sustainable food supplies, protect habitats, and achieve water conservation around the world. 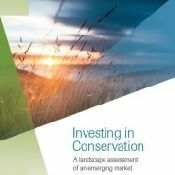 The Global Canopy Programme says it will cost $300 billion annually to meet the current conservation challenges, and the survey says that $50 billion is flowing now, of which $23 billion comes from conservation impact investing which they expect will hit $37.1 billion over the next five years. While the report identifies excess demand for conservation investments, that doesn’t apply to programs that slow climate change by saving endangered rainforest and reducing greenhouse gas emissions from deforestation and forest degradation (REDD). Although the report identifies substantial public-sector investment in REDD, it only includes private-sector investment in its figures because these are the only ones that intend to either return principal or generate profit. “Some REDD investments’ are functionally grants, the report states, citing the Norwegian government’s $500-million-per-year allocation. “While the private investors in funds such as the [Forest Carbon Partnership Facility] likely expect that their capital will be (at least) returned, most of the money invested in these funds comes from governments that only expect to see a return in the form of carbon credits, which they will then retire as a way to meet emissions reduction targets. The report does include the purchase of REDD+ credits by private-sector initiatives that see them as an investment. “Private firms such as Permian Global, Livelihoods Fund, Althelia, and Wildlife Works have created businesses built around investments in projects that deliver REDD+ credits, the report states. “These firms believe that emissions from forest degradation have been underestimated, and therefore mispriced. The report was overseen by a steering committee that also included the David and Lucile Packard Foundation, The Gordon and Betty Moore Foundation, and JPMorgan Chase & Co.